When you live in Saudi, you often find yourself planning your next departure. Sand, blue skies and date palms might sound romantic, but they don’t quite make up for the restrictions of everyday life. Six months ago we decided on a week’s holiday in Sri Lanka. We would start in Colombo, driving to Kandalama to see the ancient city of Sigirya. From there we would travel to the tea country of Nurawa Eliya, stopping on the way to visit an elephant orphanage in Pinnawala. We would finish our whirlwind tour with a visit to the ancient Portuguese settlement of Galle on the Indian Ocean coast. Much travelling and much to see in a very short time! Our plane touched down in the early morning. 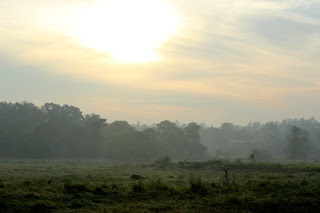 Gathering up our inflight baggage, we stepped out into Colombo’s mist-laden sky and muggy heat. 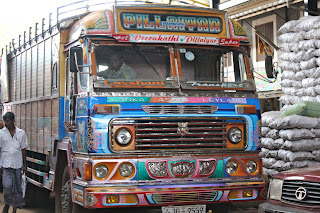 Waiting for us on the other side of customs was our tall and smiling Sri Lankan driver, Laksman. With local Sinhalese music playing on his van radio, we set off for the first stop in our Sri Lankan adventure: Kandalama and the Heritance Hotel. The ‘main road’ was narrow, winding and crowded with traffic. There were vans like ours, bicycles and cars. 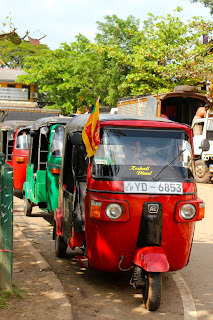 There were also tuktuks, a local form of taxi. These small, three-wheeled vehicles of doubtful stability wove unpredictably in and out of the traffic. 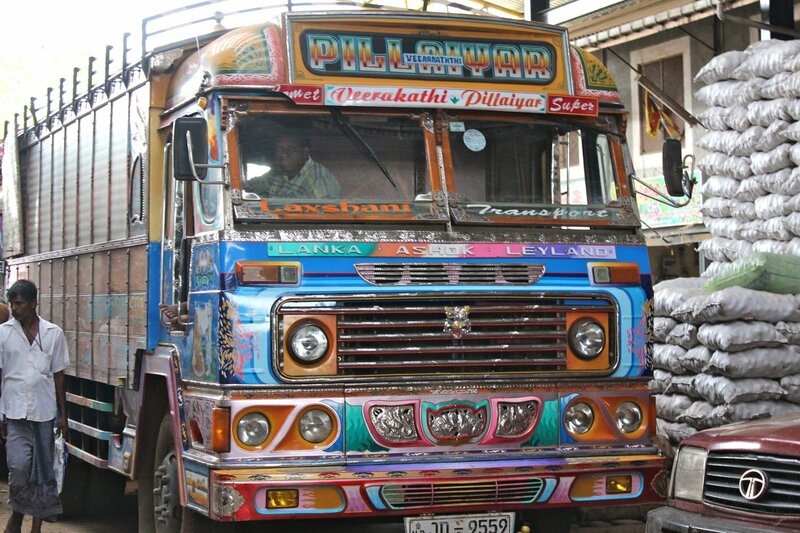 Added to this mix were large, brightly-painted trucks which approached at high speed and passed by alarmingly close. On one side of the truck was written ‘fast as a comet’ - and ‘fully insured’ on the back. They seemed better suited to a carnival than heavy duty work. Pedestrians crowded each side of the road. Amongst them, bone-thin dogs prowled for scraps. The women wore vibrantly-coloured sarongs and saris. 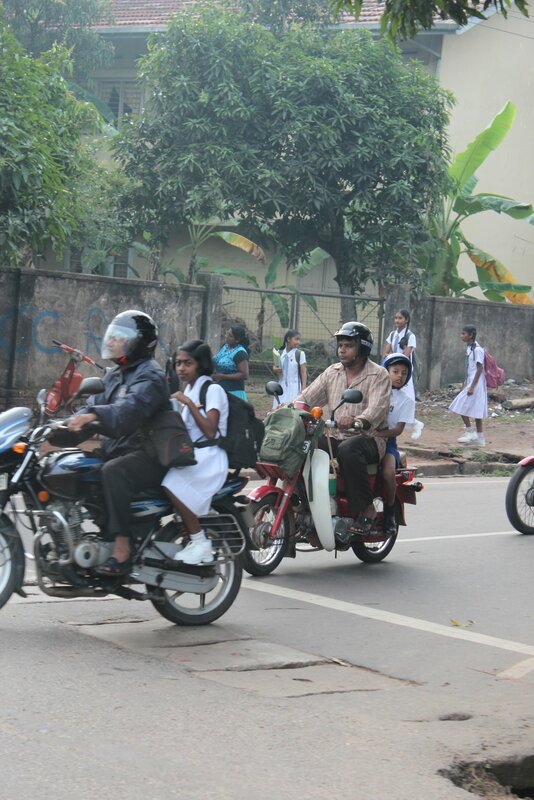 They seemed oblivious to the hazards of cars, vans and tuktuks all jostling for road space right beside them. We passed ramshackle roadside stalls, made from bits of corrugated iron, timber, flax palms, and tarpaulin. I saw bananas hanging in huge bunches, pineapples and piles of coconuts. Other stalls had braziers out the front, where fresh corncobs cooked beside piles of discarded husks. The homes along the roadside had mudswept front yards, open windows and verandahs. 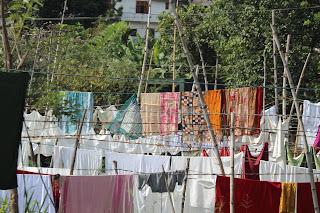 Washing lines were strung from tree to tree, covered with clothing. Between the houses were rice paddies. In one a large cow wallowed up to its knees in mud while on its back perched a perfectly white and motionless egret. Further along we passed a roadside shrine. Two men stood poised, their backs to us. Hands rose in supplication, they chanted and bowed before flickering candles. Most of the island is Buddhist but we also passed a few Catholic churches; one with a statue of Mary holding an infant Jesus and another a crucified Christ. Both were larger than life, and decorated with garlands of coloured fairy lights. Then, suddenly out of nowhere, or so it seemed, Laksman slowed down and pointed out the Dumbilla Cricket Stadium. Apparently this is a well-known site for those who follow cricket. New Zealand had played Sri Lanka here. Not being a follower of cricket, or any sport for that matter, I let the others nod intelligently. As we approached yet another blind corner a small red van overtook us. It was obviously selling freshly baked bread - sort of the Sri Lankan bakers’ equivalent to Mr. Whippy – but instead of playing Greensleeves, this van was careering along the road playing the theme from Titanic. We stopped at a village supermarket to buy water. There were people everywhere. Children looking pristine in white pressed uniforms headed to school, some walking, others on the back of the family motorbike. Six water bottles cost us less than a dollar. 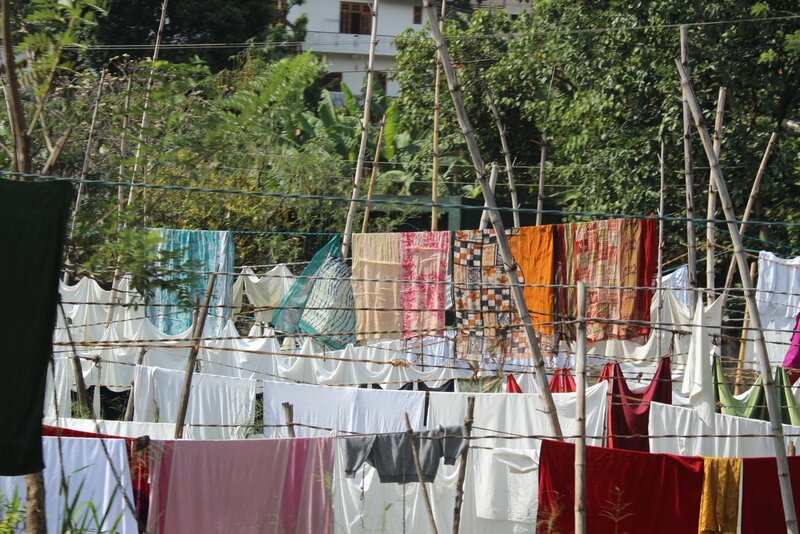 Life in Sri Lanka, we were learning, was not expensive.